Yesterday on my way home from work I drove past a small little marshy pond that is about a mile from my home. I have never seen an osprey there before, but there was an osprey hunting in the late afternoon golden sunlight, so I pulled off on a side road to watch and enjoy. The first plunge into the water was unsuccessful, but the second big splash produced a bright goldfish! He went to a tree to eat and my first thought was, is he banded? Yup he was! That lead to some jockeying around with the car in different spots to get a good view of the band. I found the right place to read the band and was surprised! He was a male from a nest that was about ten miles away! I wondered, have all his chicks departed on their first migration leaving him free to start moving south a bit? Hmmmmm. So this morning I headed to his nest to see what was going on. When I got there, I burst out laughing. It was choir practice time for these three female chicks, "singing" their cute little heads off. Seriously, what a ruckus! Ha ha. I guess that was why Dad was eating peacefully so far from his territory! Part of the reason for all the hollering was that there was an adult male nearby, but when I read his band I was surprised that it was not Dad! It was another young male that I had seen earlier in the spring at another nest before he was chased off by that resident male. This male was actually hatched in a nest a few miles away, so he is looking for a nest, a territory, a mate, somewhere near his natal nest. It did not take too long for the Dad at this nest to show up with a fish, that one lucky chick grabbed quickly before Dad took off after that other male. So things are still interesting out there! I am always curious about how far from their territory they will go during their regular daily activities. I have also seen the single male and one female chick, still doing well. I did not see the male chick. Still so pleased to see this male, even tho now his behavior is just what every male would be doing. Just knowing all that he went thru and how successful he was at caring for those chicks alone, is touching to me. He will always occupy a soft spot in my heart. I also visited the oldest male recently. I saw him drop a fish quickly for his two chicks last week and on Sunday I returned to try to actually read his band to confirm, but although his two chicks were still there, also facing each other and hollering, I did not see the male. I think he was around but I could not locate him. An adult male flew over once. I will try again. Some nests are empty, I am not seeing adult females at most nests. I still enjoy searching for the birds and savoring all the sights and sounds...wondering each time, will this be the last time I see them? Just a quickie....checked on the single male and his family today....did not find either of the juveniles, but dear Mr Mom was perched very high, watching over his territory, constantly looking around. Have the chicks departed? Just out and about exploring today? Don't know, but I am still touched to see him there watching, in case they need some food. Sigh. I check them as often as I can because, as you know, this family has captured my heart. I also searched again for the chick I released after several weeks of rehab and could not find him. This is discouraging. I also met yesterday with a gentleman from a company who had a pair of Ospreys build a nest on their property in an problematic place. They want to remove the nest but build a nestpole for them elsewhere on their property. We are working with them to make this happen. I have donated a nestbox and have been busy sending emails to try to find someone to set a tall pole for us. Some of my contacts have been helpful... Hopefully we can make this happen. Doing what we can to help the birds! It is getting to be quiet out there in ospreyland. Finding a single bird here and there....a few loud juveniles still packing on the pounds before they begin their big adventure. Although I am tired from so much hard work all summer, I hate to see this time of year come. I still feel like there are loose ends, questions unanswered, data I didn't get. But this time of year I just have to accept some of those holes. Just feeling like I still have to find some Ospreys to hang out with! Their days are numbered now.....but it's been an interesting year. We have learned, seen new things, weathered some trying times with people, politics and the birds themselves. I savor the sights and sounds of our beautiful winged friends as I see the subtle change of color surrounding the nests, leaves beginning to turn yellow, prairie grasses turning also, the sound of dry leaves rustling in the wind. How did we get here so fast? Once again I have gotten behind in writing some posts for you all. So many stories to follow up on, so many loose ends to try to tie up. I spent all day Saturday and Sunday last weekend searching for the chicks that we released after several weeks in rehab. His parents had given up and left the nest and he exams capable of flight during his time in the hospital. These situations are so difficult. We decided to release him near a nest where we hoped the active family might adopt him and help care for him. This does work sometimes. The younger they are, the better it works. At any rate, he was not adopted by any of the families in the area. We saw him a few times over that first week, always with an empty crop, but not looking all that bad when I last saw him. That was almost two weeks ago. All my searching last weekend did not locate him. I also looked for over three hours yesterday and did not find him. I am afraid he may have perished with no adults to care for him. I will still look, but its getting harder and harder to find chicks now. On a happier note I have visited the single Dad who lost his mate when the chicks were very young, and he successfully cared for these chicks on his own. They all fledged, but one landed on a power pole and cross phased, which resulted in electrocution. But the other two chicks are doing very well. I never seem to be sleep to find everyone at the same time but between visits on Thursday and Friday I did see both chicks and dear Mr Mom. He was chasing a bald eagle away, followed by a juvenile learning the skills of eagle chasing! I even saw one chick return to the nest, all wet, with a fish! I am so thrilled that this very special super osprey has been so successful at raising these chicks alone, playing both Mom and Dad to them. They are so beautiful and healthy. It was not easy for him, but he managed to balance his double role perfectly. Today I went to visit our oldest male at 23 years of age. He is still bringing fish for his two chicks. We have never had a male this age breed successfully. 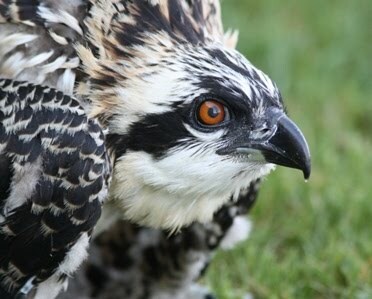 So this male also can be considered to be a super osprey! I also was thinking about a male who had his nest blow down in a storm last year, destroying all the eggs. I saw him once early in the breeding season this year, in May, dropping sticks on a power pole. It never really turned into a nest and I have wondered what happened to him. I have looked for him so many times as I was in that area, but never saw him again. I just wanted to make one last effort to find him and as I drove a route today that I have driven SO many times this year, I saw an adult perched in a dead tree. I stopped the car and put the spotting scope on the window, and gasped....it was him! Waiting for me! In my field notebook I wrote, " WOW, this is WEIRD". When I go looking for a specific bird, it is often like searching for a needle in a haystack...and to have him show up like that gave me goosebumps. I don't know where he has been all summer. I looked for a new nest in the area but did not find one. He would not share his story, but he showed me that he is alive and well, and still in the area. So many searches for the rehabbed chick have failed, so to locate this fellow just when I wanted to find him, is one of those little miracles that seems to reinforce my connection with these birds, and tells me that the effort is worth it. Especially on this very hot and super muggy day, when it's a challenge to be out there all day. My curiosity about each bird, how their stories unfold, what their behaviors reveal about the species and how we can better care for them keeps me going, paddling upstream so often, learning as I go, putting the pieces of the puzzle together...and sharing it with you! I was back out there yesterday, looking for the chick we released last week. After many hours of searching, I did find him. Maybe he has a daily routine because I found him in the same place and the same time as Barb saw him the day before. Earlier in the day, he was not there. Anyway, he looked better than he did when I saw him briefly last Saturday. His crop was not as sunken and hollow, he had no salt around his nares. He did not have a full crop by any means.....but it appeared that he probably had something to eat that day. He was near a nest, food begging, but he did not go to the nest where another chick was food begging. I then saw him swoop down towards a small creek. I did not see him come up with a fish, but it appears that he is trying to feed himself. Must be finding enough food to stay alive. And of course, as time goes on, he will get better at fishing as he practices those skills. He has been given a crash course in growing up. He is a pretty cute little fellow, fighting the odds. Another tough cookie! And we will continue to do our job of observing, taking good notes, so we can learn more about what happens when a young bird ends up in rehab and has no family to return to. It will make us better at what we do, so we can help these birds when necessary. I also had a little thrill when I learned that cumulatively the papers I have coauthored about Ospreys have now been cited by other scientists over 100 times! Nice to know that my efforts have contributed something to the general knowledge about Ospreys! Don't mean to toot my own horn, but it kind of amazes me! Makes me feel like all the sacrifice, effort and hard work is worth it. I have a quick little update for you regarding our single male. I did not see him when I was there for over 90 minutes yesterday. On the surface, that may be no cause for concern after chicks have fledged. But nothing is normal on that nest so I worried about him as I tossed and turned last night. So this afternoon on my way home from work my car took a detour and I went to check on him. At first all I could find was the female juvenile, flying around whining all the way. She is a very vocal chick! I searched for the Dad and finally spotted him perched quite far away, very high up watching over his offspring. Again my hand went to my heart. Of course, he is near, he is watching, he is a rock for this family. I am amazed that I noticed him, and he was probably there yesterday also. He looked like a king observing his domain. He is staying out of the way, as the crazy kids come and go. He no longer perches on the nest edge. He avoids the chaos but he is there if they need food. I did not see the male chick today, but he was fine yesterday. Another busy day in the field which began with a few hours of searching again for the newly released chick. I could not locate him. I hope to try again later this week. I moved onto a few nests I haven't visited in quite some time. I ended the day back at our single dads nest. Sadly, I have some bad news to report. I also stopped here yesterday and found two fledged chicks but could not locate the third one. Mr Mom was present and eating a fish himself as the female chick waited quietly next to him for some food. Then he moved over and began to feed her. Sweet. I returned today to try to find that third chick. Two of them were zooming all over the place, fledged successfully! As I searched for number three, my heart sank when I found him hanging dead from a power pole. He must have been electrocuted. It is a disturbing sight that made me nauseous. As I said earlier, when the chicks fledge, they are safer in one way as they can fly away from a predator, but they are also open to a whole new world of trouble. We have to remember that over 50% of them do not survive the first year. I still view this male as being a remarkable, devoted osprey that did successfully fledge three chicks all on his own. He cared for those chicks heroically since they were about three weeks old. Newly fledged chicks often land in bad places and make bad decisions and some of this is just bad luck. This one is hard to accept because we so wanted this story to finish with a fairy tale ending. As I watched the two beautiful remaining chicks, a male and a female, I saw no sign of Dad in 90 minutes. I am not too worried tho because I think he knows they can fly and they may not need to be guarded quite as much now. He may have been watching from someplace where I couldn't see him. Just the same, I will return to look for him in the next day or two. It's been a tiring week, and I hope I will have some better news this week so we can celebrate the successes! It's been a busy week in ospreyland. I was out checking nests all day on Wednesday, trying to confirm final fledging numbers and getting those last bands read. When I got home I had a call from The Raptor Center about a chick that was ready for release after two weeks of rehab. (We believe he blew out of his nest in a storm.) After just battling thru rush hour traffic I needed to turn around and head right back to where I came from! Ahhhhhh. But after some discussion it was decided that this guy really needed to be released that evening. I always try to do what's best for the birds regardless of the inconvenience to me. This was a tricky one tho because his sibling had died, and with no chicks to care for, the parents had left the area. So we would have to release him near a nest that still had chicks and parents actively feeding them in hopes that they might adopt this juvenile. My field work that day had gathered the info we needed to decide where to release this chick, so off I went again. He flew off fine, but did not go to the nest. He landed in a nearby tree, in a somewhat awkward spot with a lot of small branches. I stayed and watched him until 8pm. The next day it was raining and my concern for this guy sent me right back there to look for him. He was not in the tree. I walked and drove all around for 5 hours, got soaked to the bone. I kept finding the resident chicks from the nest but not the newly released chick. I finally went home defeated. I had to work the next day, but one of my faithful volunteers, Barb, spent some time looking for him. She too was skunked. Today I went back again. I drove around and hiked for 4.5 hours, finding various chicks from other nests, also found a new nest being built! But my concern just kept increasing. Suddenly I saw an osprey perched on a pole and I slowly approached and was finally able to read his band and confirm that it was him!! Alive! His crop was very empty tho. He had moved away from the nest that we hoped would adopt him and was hanging around near another nest, but when he flew to the nest, he was chased off. These kinds of situations are difficult. I have seen a juvenile move to a new nest on its own and be fully adopted, cared for and fed. I recently received an email from a scientist in the U.K. asking me about this behavior. I have also been rereading some emails from my mentor Sergej about these movements of young birds between nests. Do adults recognize their own offspring? It is instinctive to chase off an intruder, but why do they allow some juveniles to take up residence? Sergej believed if the chick arrives when the parents are gone, they accept them.....but if they see the chick approaching, they will instinctively chase it. (I once observed an adult female attack her own offspring who was just learning to fly!) In this post fledging conundrum, this chick was chased off even tho one of the resident family's chicks seemed to have disappeared after fledge so how did they know this was not a missing part of their family? Ironically, the real parents of this chick were building a frustration nest nearby! But it is known that after several weeks of not caring for chicks, their parental instincts seem to turn off. Will they find each other and resume their relationship? I doubt it, but this is why we keep watching, and always taking good notes! At any rate, after many hours of searching, I am happy that our released chick is alive. After he was chased off, I lost him again. But we will keep watching for him, to see if he is being fed somehow, since most newly fledged chicks are not able to feed themselves consistently. I always remain curious and every situation like this is different. All my time observing them just adds to my understanding of these birds. My mentor, Sergej Postupalsky, who died last year has left me a treasure trove of emails that I still refer to often. He studied these birds for over 50 years and he had the kind of knowledge that only comes from doing intensive fieldwork for many, many years. So tonight I am tired, but a bit relieved.